Beautifully refurbished, high quality house in a unique location - an area of remarkable history and outstanding beauty, our permanent home and not just a summer home, it is great for all four seasons. The style of its architecture is French Quercy including a Pigeonnier tower. Inside the rooms have significant exposed oak beams of great character and wood floors. Located in a quiet country lane on the outskirts of the pretty sought after village of CATUS (walking distance) and within 20 minutes drive of CAHORS the Capital city of the Department of the Lot. CAHORS is exceptional in that it's medieval with a range of interesting and quality shops and high end restaurants, a renowned market and riverside location (Lot river). The house boasts of two Oak staircases, servicing each end of the property, two kitchens of which largest is a magnificent entertaining space with dual aspect (front and rear gardens/pool views). Outside offers further substantial dining possibilities underneath an open oak-framed loggia with a tiled roof. The second kitchen is a smaller summer kitchen which could service as separate annex accommodation (rental possibility). Outside area has a beautiful 12m long pool with saline non chlorine filter system and extensive surrounding patio which is very private being located to the rear of the property. Also a large detached garage/workshop and stone built ex Shepherds hut garden workshop all with power and lighting. The property could easily be re-configured with minimal adjustment to add more bedrooms: re-model gym and study areas (which have independent WC and shower room facilities). If desired the potential annex arrangement is easily serviced with its own dedicated entrance. Holiday rental income is high in this area of impressive natural beauty and would offer excellent return income, although the property has never been used in this manner. 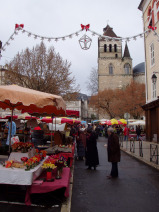 The area is serviced (all year-round) by airports at Toulouse, Bergerac and Brive. There is a frequent and reliable train service from Paris. After working in France for 10 years we are looking to relocate back to the South of England for retirement and would consider part exchange with cash difference either way or just straight sale.